Posted By:Unknown | At:2:22 PM Be the first to comment! 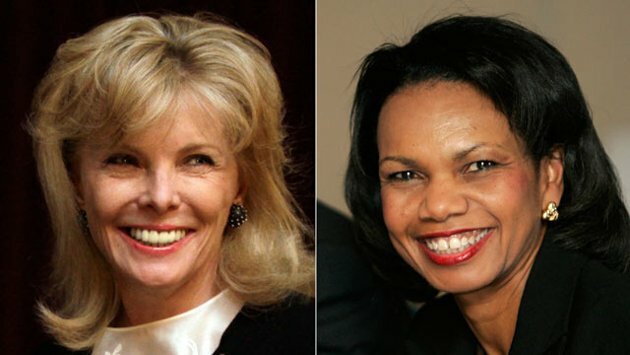 (ABC News) -- After decades of controversy, the all-male Augusta National Golf Club has admitted its first female members, former Secretary of State Condoleezza Rice and business executive Darla Moore. Augusta National Chairman Billy Payne called the selection of the two new members "a joyous occasion" and a "significant and positive time in our club's history." "These accomplished women share our passion for the game of golf and both are well known and respected by our membership," Augusta National Chairman Billy Payne said in a statement. "It will be a proud moment when we present Condoleezza and Darla their green jackets when the club opens this fall." Rice, who served as secretary of state under President George W. Bush, said in a statement released by the club, "I have visited Augusta National on several occasions and look forward to playing golf, renewing friendships and forming new ones through this very special opportunity." Rice's statement did not mention her ground breaking role or the club's long refusal to admit women members. "I have long admired the important role Augusta National has played in the traditions and history of golf. I also have an immense respect for the Masters Tournament and its commitment to grow the game of golf, particularly with youth, here in the United States and throughout the world," she said. Moore is the vice president of private investment company Rainwater, Inc. and founder and chair of nonprofit think tank, the Palmetto Institute. "I am fortunate to have many friends who are members at Augusta National, so to be asked to join them as a member represents a very happy and important occasion in my life," Moore said in a statement. "Above all, Augusta National and the Masters Tournaments have always stood for excellence, and that is what is so important to me." Since its inception in 1932, Augusta National has been embroiled in several heated debates for not allowing female club members. The debate heightened in 2002 when Martha Burk of the National Council of Women's Organizations pressured the club to admit female members. The club's chairman at the time, William "Hootie" Johnson resisted, saying famously that women may one day be admitted to Augusta National, "but not at the point of a bayonet." The statement represented both the resolve of the club not to crumble under pressure. The issue surfaced again in April when Virginia Rometty was appointed chief executive of IBM, a corporate sponsor of Augusta National. The CEO of IBM was traditionally admitted as a member of the club, but Rometty was not granted membership. Another of Augusta National's club sponsors, AT&T commented on the historic admission. "As a sponsor of The Masters, we applaud today's historic announcement by Augusta National and warmly welcome Condoleezza Rice and Darla Moore as members of Augusta National," said AT&T's CEO Randall Stephenson.